Display your family name proudly! Celebrate your family with pride and love this holiday season with this personalized framed print that prominently displays a single initial, the inspirational quote pictured, and any family name containing up to 12 characters. 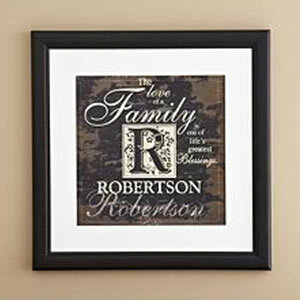 This elegant Family Initial Framed Print is exquisitely designed to look impressive on just about any wall of your home. It makes an excellent Christmas gift for that special family on your shopping list this season, and at this price, you can afford to order one for yourself and all of your friends and/ or family members! Measures 16 in. x 16 in.